Perkins-Tryon High School students are finding success both in the classroom and on the field. 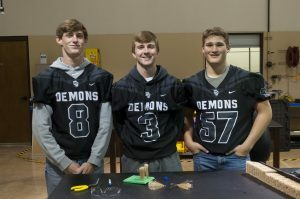 Caden Williams, Gage Allen and Zach Frazier are balancing a full schedule that includes high school, the Pre-engineering program at Meridian and playing on the Perkins-Tryon football team. 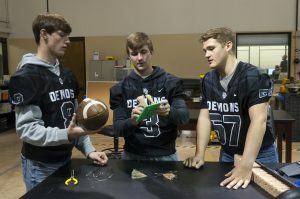 At Meridian Technology Center on a Friday game day, the trio was busy at work on one of their assignments developing a football tee that would keep the ball from blowing over in the wind. Like Williams, Allen and Frazier, many of Meridian’s students are involved in other activities at their high schools. 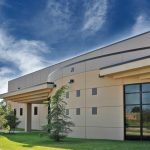 “Coming to Meridian doesn’t mean you have to give up extracurricular activities like athletics and band that come with being in high school. 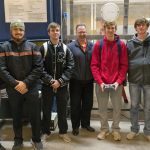 You can do what you love at Meridian and still participate at your high school,” said Debbie Short, a Pre-engineering Instructor at Meridian. “Balancing school and sports is a challenge, but I enjoy it, and the instructors are understanding. I just have to be more diligent to make sure I get everything done,” said Williams, a senior, who also plays baseball. Frazier, a senior, joined the pre-engineering program for the rigor. Allen’s siblings attended Meridian, and he had always wanted to attend Meridian as well. “It’s tough, but I enjoy the challenge. I just have to make sure I put school first,” said the senior. Balancing school with athletics has not hindered their success on the football team. Williams is a captain for the football team, the second-highest-scoring kicker in the district and fifth in the state for class 3A football, according to MaxPreps statistics. Frazier is the district’s number one and state’s number four in interceptions. Allen is starting center as a sophomore. Through all these successes, each of the students is keeping the future in mind and aims to pursue a degree in engineering after high school. 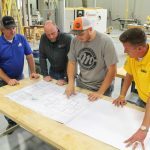 Photo: From left to right, Zach Frazier, Caden Williams and Gage Allen work on a project for their Pre-engineering program at Meridian. All three play varsity football for Perkins-Tryon High School as well.